Toka Ebisu' means the Tenth Day Ebisu, and indeed the highlight, a colorful parade of palanquins bearing geisha and famous celebrities, takes place on the 10th. Other attractions include geisha dances, traditional performing arts and rice cake making. The festivities each day last well into the evening, when the streets are illuminated with colored lanterns and lights. More than a million people pass through the shrine during these three days. A similar 'Toka Ebisu' festival takes place in Wakayama on the same days, and other, smaller celebrations in honor of Ebisu take place around the country throughout the year. Amagasaki Ebisu Shrine is said to have been constructed during The Emperor Daigo era (A.D 897 to A.D 930) or before. 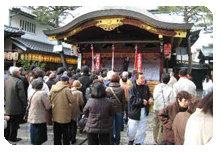 11Gods are deified here in Ebisu Shrine, mainly the god called Ebisu. Ebisu is one of the 7gods of fortune called "Shichifukujin". He is depicted as a man holding a sea bream and clutching a fishing rod. He has brought us happiness as God for fishing and commerce since ancient times. A celebration of Ebisu is held the 9th-11th of January every year and is known as "Toka-Ebisu" symbols of good luck such as small models of sea breams, rice storehouses, gold coins, and straw rice bags and so on are attached to bamboo and in prominent places in houses and shops. In this way, we wish for prosperity in business and the safety of the family around a year.